Players remain in their teams of 4. They have 2 players inside the square and 2 players outside of the square. 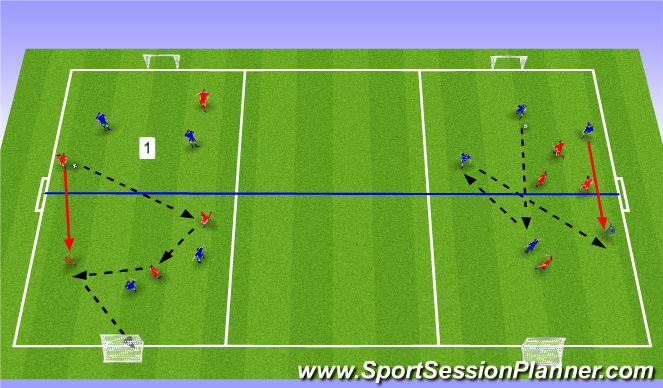 (1) The ball starts with a player on the outside who passes in to one of the middle players, the non receiver tries to get in to a position where their team mate can link up with them and they can play out to their other supporting player on the outside. This process then continues. Swap roles after 60 seconds. 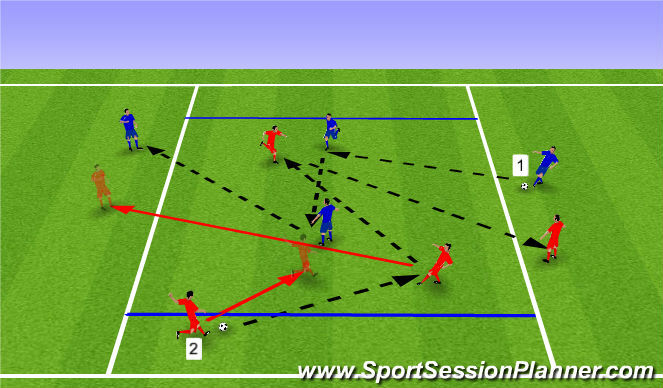 Players must scan the area to develop an awareness of what is around them, where to take their touch and where and when to pass. 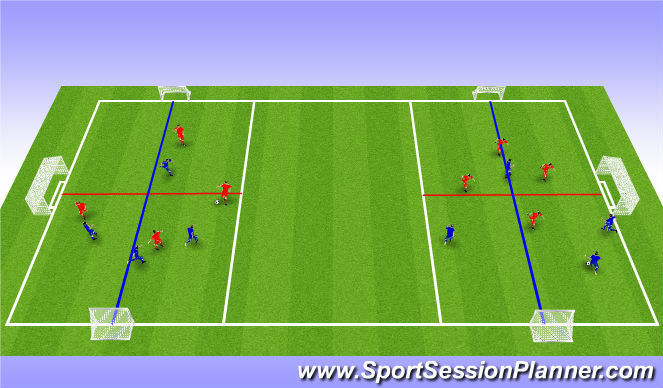 (2) To progress, if an outside player passes in, they move into the square, creating 3 players in the middle. The receiver must combine with one of the players in the middle before vacating the middle square. The ball is then played out to the opposite supporting player and the sequence continues. Play in - go in, set - go out. To challenge players ask the supporting players to ensure they find a new space on the outside to ensure their team mates in the central area are checking their shoulders. Each time the sequence is completed a team gets a point. Play for a time limit and see which team creates the most successful passes. The players are split into 2 groups and play 4v4. Each pitch has a small goal at each end and the areas are set up being compact. Each team has a Defender and a Striker, these players can move anywhere in their own half and cannot cross the red half way line. They also have a LM and a RM, these players can move up and down their side of the pitch but cannot cross the blue central line. This will get players thinking of their positioning linking in with the diamond play. To progress allow players to switch position before going in to free play. The players are split into 4v4/3v3 games. Offside is played from the half way line. A goal must be scored from the attacking half. A team can only have a maximum of 1 player left in their own half before they can score, this will encourage quick transitions and ensure that players are making forward runs, creating overloads. If a goal is scored while your opponents have 2 or more players left in your half it is worth 3 (as displayed in diagram 1). This will reward scoring with overloads.